Titanium grade 2 elbow 4″ welded with Gr.2 seamless pipes. 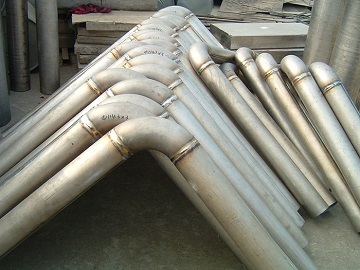 Titanium grade 2 elbows welded with seamless pipes. Elbows: 90°, 4″ SCH10S long radius, ASME B16.9, ASTM B363 Gr.2, seamless type. Pipes: 4″ SCH 10S (Φ114.3 mmx 3.05 mm), ASTM B861 Gr.2 seamless titanium pipe. These pre-welded fittings are supplied to a Slovak company for a chemical plant. The welding method adopted is manual TIG(GTAW) which is performed in accordance with AWS D10.6.